Posted on 09/29/2014 in Uncategorized. 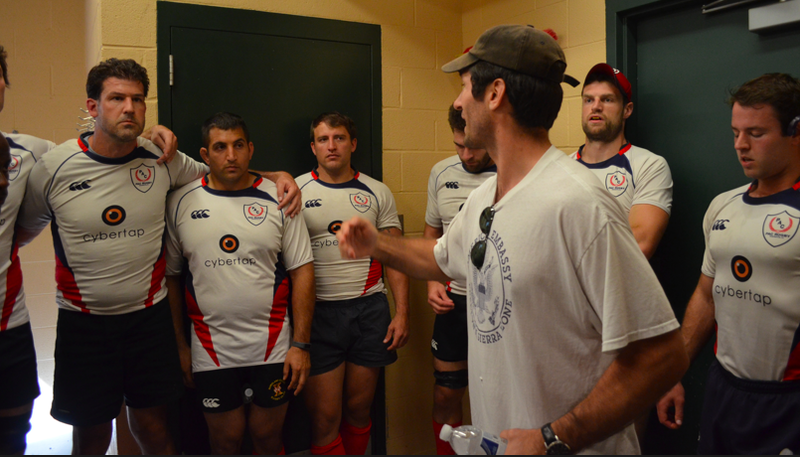 The Potomac Exiles travelled to Pittsburgh with a strong squad featuring many players making their A-Side debuts. The Exiles allowed a soft try up the middle, but an inspiring pre-game speech from Coach Chris Mahony triggered the team to quickly shake off the error and execute the game plan. After the defensive miscue, the forwards showed brilliant execution and patience as they executed a maul from the 20 meter line all the way into the try zone, dotting down the score. Shortly after, fly half Matt Quigley dished to flanker Alex Diegel off of a penalty, who crashed across the try line for the 14-7 Potomac lead. Next up in the scoring onslaught was Iseijah “Juice” Allen, who dotted down the score in the corner after great team ball and a crafty dish from prop Paul Gabriel. Up next was Quigley, who made a great read off the back of a ruck, dove across the try line and converted his own score for the big halftime lead. The visitors picked up the second half just as they left the first, with new winger Chris Frazier scoring back-to-back tries to extend the lead. Quigley (moved to scrum half after the break) followed Frazier’s lead with another try in the 60th minute. The Exiles benefitted from numerous PIttsburgh miscues to keep the score one-sided, and Captain Ben Wiedemer finished the rout with a great line through a huge hole. Fly half J’Son Townes converted for the final score, 56-7. There was no B-Side match on this day, as Pittsburgh had issues with numbers, and a match was not available to be scheduled locally. Man of the Match: Auggie Baldioli, who dominated the scrums so much the ref had to give a warning about lifting his opposite number.